After many many posts here i decided to do a build thread. This is my way of keeping my mess to a minimum and trying to do my part to learn. So here goes, a little background on me and the car. I have only owned a few cars and done a little work here and there with help from others. All i have learned has been on here and talking to others. I have only done a few projects on my own cars.I am a NOOB. not proud but beginning to learn. My old car were '83 corolla 4speed (rwd hella fun for my first car), '83 cutlass sierra (only fun because you could bury the speedo and literally watch it disappear), '93 probe (2.0l mtx, short ram w/cat delete), '95 sierra (ext long bed 4x4 with a 454 and flowmaster), 91 civic (4 door dual resonantors, and fart cannon atx (never again)). 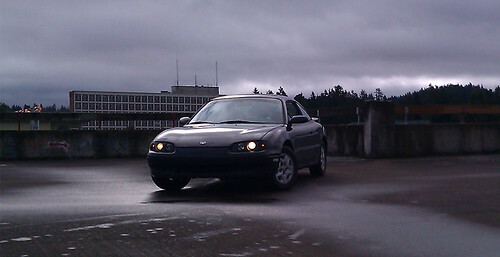 My car: '93 mx6 2.0l mtx. Bought with a totaled title and lien paper work from a tow yard. It had a toggle switch with push button to start. No keys! It had 127k when i bought it, bald tires, worthless control arm bushing and broken exhaust tip. Crappy cone filter with the sensor for intake air temp electrical taped into the aluminum intake pipe. 40+ feet of speaker wire running through different panels and some damage to the drivers fender from running something over. 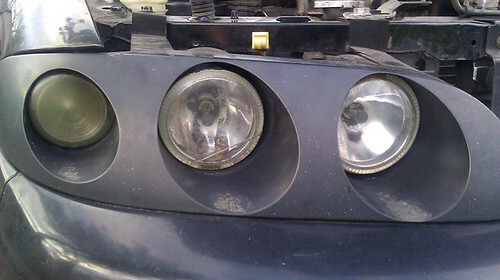 Along with a toasted rear motor mount and burnt out angel eyes that had the housings melted. It had a painted valve, headers, short throw shifter and an attempt at 2.5" exhaust. pretty sure that covers it. I paid 1k. I am starting to get a laundry list of stuff done to my car. Does that make it fast? No! Does that mean i spent too much money on a toy? Maybe. Do i have fun every time i jump in my car and drive? Hell yes. Work as of today: had a friend fix the exhaust (he owns a shop) put in dual aero resonators and deleted the cat. I have put in new control arm, fixed the IAT and put new cone filter in. Pulled all "after market wiring" and rehooked up the stock stereo harness. Installed a sound system. Had keys made, put new tires on the stock wheels. Put in a rear poly motor mount, new projector angle eyes. I pulled the mud flaps on the front, pulled the decals, installed new tweeters, visors and found random parts that were missing (like the stock jack and tire changing stuff and power antenna). Pictures are in my sig for current stuff. will be posting new ones soon. 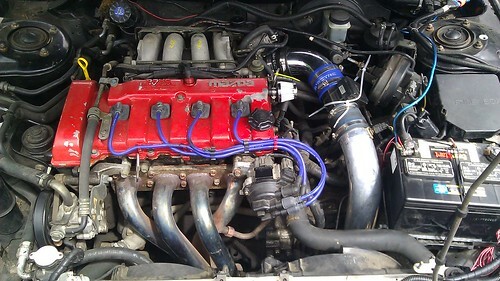 One of the routes I am thinking about going is to buy a used motor and rebuild it. I can do a few things this way one is to take care of current issues like bad piston rings, a ticking lifter and learn how to work on my own bloody car! the small things i have done to keep it on the road lately is replace a hydraulic line that powered my clutch slave cylinder, replaced my intake elbow with a 45 degree spectre elbow and put a valve cover breather in since the stock elbow was cracked and some other random stuff. Last edited by friendsofdonr; 6-26-11 at 13:17. Before new lights taken with my phone! Also in my signature. I swear i can never remember how to post pics on this forum! Last edited by friendsofdonr; 6-29-11 at 20:30. 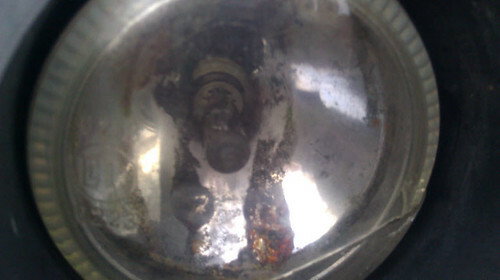 They had pulled the ignition switch sylenoid (sp?) And had it wired into the plug that goes into the switch. Toggle switch for constant power or accessories and then the push button for when you would normally turn the car over. Simple 4 wire conversion if I remember right. I pulled it out when I bought the car cause I didn't want the guy to steal the car I bought from him since it had no keys at the time. please ignore the zip ties and off colors, just trying to keep up on upkeep right now. Got a front motor mount coming. can't wait to be able to not mis-shift cause of motor rock! btw the number wrote on e the plug wires was not me! I bought em that way.... Also remembered how to do the photo thing so pictures above have been changed from links. Last edited by friendsofdonr; 6-29-11 at 20:31. If you want to post a picture, right click the one you want (if it's on the INTERNET somewhere) and select "copy image address/location", then, when writing a post here, click on the little yellow square with the mountain in it (2nd from the right) and copy the image address in there. As for videos, just copy and paste the address from the address bar. If it's a youtube video, the site will automatically show the video. Your Heart Beats, Mine Rotates! thanks man i had gotten it figured out, when hosting on flickr i was trying to use the code they gave me figured out a different way to get it though. I'll try your shortcut next time. yep.... wd40 quieted it down for 2 weeks! gonna try some tri-flow with teflon for bike chains, next (its what i have laying around). heres an interesting read concerning how to quiet noisy HLAS!this is off of a website selling the hlas (http://www.store.partsdinosaur.com/page67.html). putting it in here only cause i may try this. 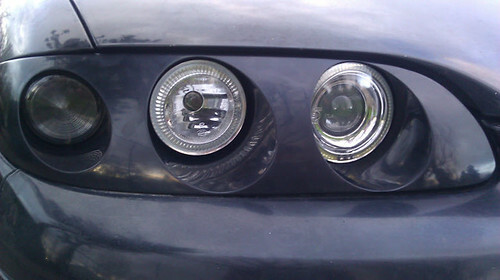 next week end gonna instal fogs (minus wiring) and hook up halos while i install a new front motor mount! Well installed the front motor mount today. had to file the holes out so it would accept the larger hardware of the King 6 Poly mount. But now it is a whole new car. When i looked at my old mount the rubber had started to separate in the center and the metal had actually started to crack at the welds. Oh yeah and i could easily twist the center part from side to side. I bet it was the original mount from 1993. this fixed my gear selection problem and my torque issues! Now i still have to find time to wire halos, install/wire fogs lights and fix my sub I blew it driving to portland with the windows down. oh well it was only and 8" jbl. now time to upgrade to 2 12" jbls. Small update: Classes are almost over and work is winding down for the summer. This is good since I am in the midst of wedding stuff. My squeeky clutch is starting to get to me and i sprayed some white lithium grease on it only to get the can crushed in my back floor board the other night, and it not to work! That stuff is a PITA to clean up. I'm going back and forth on what to get for fall term. My bearing plates need replaced and so i was thinking this would be a great time to get some springs, strut bars and put in the plates, assuming my brakes aren't going out as well.I look forward to September for the wedding stuff to be over, a little extra cash and some time to work on my car. I gotta fix a few rusty spots and fill the holes from my badge removal. Sounds good man, always good to see someone working hard on their car. I been saving money to finally get started on my project which I'll make a thread for. Just got a 2nd job to save up quicker for my KLZE swap. 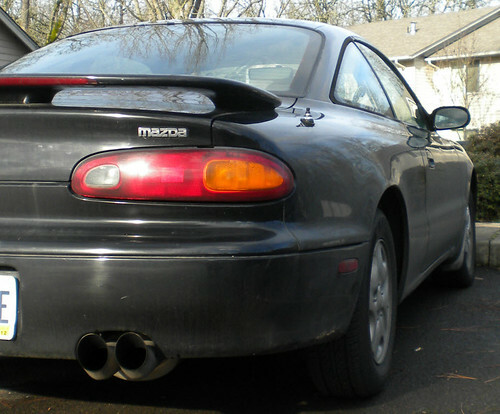 My rear badges, I believe 'Mazda' and 'MX6V6' didn't come with the car, and the holes are still there, so I want to fill the holes and make it look very clean (rather than try to find the emblems and put them on, but I'm probably keeping the hood Mazda emblem cause the 93-94 Mazda symbol is pretty unique lookin lol) Post some before & after pics when you have it done, lookin forward to it! In order to be able to post messages on the Mazda MX-6 Forum forums, you must first register.